TOP > Professional 4K Camcorder > AG-CX350 > System functions designed for live streaming. Functionality and operability engineered for professional use. HD streaming is possible while images are being acquired. Both RTSP and RTMP streaming methods are compatible. And Facebook, YouTube, and other streaming services are supported. The AG-CX350 can be used for live coverage of concerts and sports events as well as for live streaming of breaking news. * P2 Network Setting Software is required for the use of the RTMP function. See the section, “Connectivity-verified live video services,” for the live video streaming services that have been confirmed to be compatible. The AG-CX350 is the industry’s first camcorder to support NDI | HX. * Equipped with NDI | HX mode, it allows video transmission and camera control via IP connection, without using an external converter. When connected to a system configured with the AV-HLC100 Live Production Center and HN/UN series PTZ integrated cameras, the AG-CX350 realizes end-to-end live video production of live events as well as web distribution. • NDI | HX, a technology of NewTek, Inc.
* 4K image output not supported in NDI | HX mode. *1: iPad: iOS 9 or later are supported. Android devices: Android 5.0 or later are supported. Wireless module (sold separately; AJ-WM50 or recommended third-party Wi-Fi dongle) is required. •2: The app does not support simultaneous/synchronous control of multiple cameras. Camera switching takes several seconds. SDI and HDMI can be output in parallel. Output of UHD video via HDMI and output of HD video in high-image-quality 10-bit, 4:2:2 via SDI enable a variety of uses. In HLG shooting, either HDR or SDR can be selected for each of the SDI, HDMI and LCD video outputs. The TC IN/OUT terminal (BNC) allows synchronization of the time code in multi-camera shooting. The camera number (A to Z) can be added* to the name of the recording folder to facilitate editing. * Only when the MOV codec is used for recording. Setting must be made in each camera. The AG-CX350 features a new 3.2-type high-definition LCD monitor (approximately 1,620,000 dots). This LCD monitor uses the RGBW (red, green, blue, white) pixel structure to provide high visibility even in bright sunlight. The 3:2 aspect ratio enables the display of timecode and camera status without superimposing on the image. 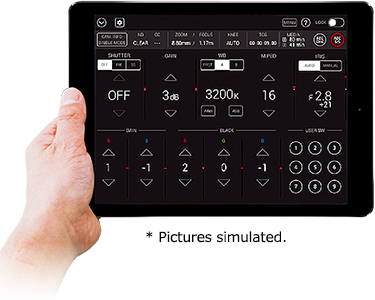 The touch panel function allows convenient touch focus and menu setting. The viewfinder is a high-resolution color OLED (approximately 2,360,000 dots, with an image display area of approximately 1,770,000 dots) that offers superb color reproduction. 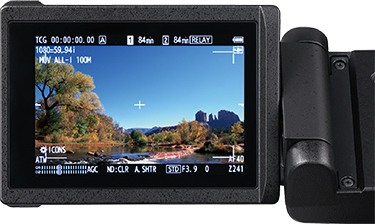 Since the AG-CX350 newly supports simultaneous LCD and EVF outputs, the LCD monitor can display the captured image at all times even when you look away from the EVF. 16-Axis Independent Color Correction: Provides an independent effect to each of the 16 phases of video images. It enables color matching of multiple cameras under the same lighting conditions as well as creative image rendering. Master Detail: Adjusts the overall degree of contour enhancement. Skin Detail: Makes skin colors appear soft and beautiful. Scene Files: Six preset files are provided. You can change any of the settings as desired. temperature, master pedestal and knee. The use of the built-in stereo microphone or XLR input (switchable 48-V phantom power supply/MIC/LINE) allows 2-channel audio recording. In MOV mode, 24-bit linear PCM recording delivers higher sound quality. Future firmware update will enable 4-channel recording. *1 Other audio features include manual volumes, OSD level meter, 1 kHz test tone output*2 and headphone output (3.5 mm-diameter stereo mini jack). *1: When MOV is selected as the main recording format, the AG-CX350 enables 4-channel recording using the built-in microphone (2 channels) and XLR (2 channels). In AVCHD mode, only 2-channel recording is possible. *2: This output is produced when the color bar is displayed. When the 50 Hz system frequency is selected, the output is 997 Hz. The AG-CX350 boasts low power consumption of 11.5 W (in factory setting, with no devices connected to the terminals), which is the industry’s lowest in the UHD/HD 10-bit recording camcorder segment. The maximum power consumption is only 17 W (HEVC recording, LCD turned ON, devices connected to the terminals). *1 With the supplied battery pack (5900 mAh), the AG-CX350 operates continuously for about 3 hours and 20 minutes. This large-capacity battery pack supports quick charges. *2 For product details, see Options page. *1: As of January 2019. According to a Panasonic survey. *2 Quick charge is possible only when the AG-BRD50 battery charger is used.